Mostly referred to as a Wheat Penny, the Lincoln one cent is known also by other names such as straw penny, wheat head, wheatie or wheat back. These pennies were produced in the United Stated during the years of 1909-1958. Their value was one cent — at the time. The designer of both the front and the back of the penny (commonly referred to as the head or the tail), was an architect from New York named Victor David Brenner. A number of the coins displayed his initials (V.D.B.) on the back of the coin in between the wheat stalks. Controversy cropped up over the initials being there and in 1918 was moved to the head of the coin, right below Lincoln’s shoulder. 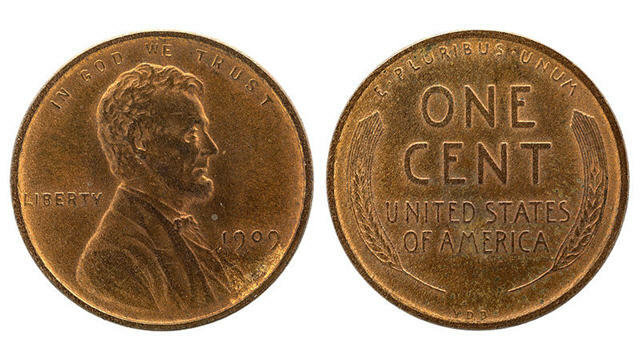 If you find one of these pennies, it could be valuable! The 1909 version of the coin, minted in San Francisco California, has the initials VDB between the wheat stalks on the back. There were only four hundred and eighty four thousand of these coins released before the changes to the initials location were made. A 1909 Wheat Penny with the initials between the wheat, and in mint condition, can be valued at $6,000 – $12,000usd. Even ones in lesser mint or poor condition, can be valued at hundreds of dollars. Other series of the Wheat Penny are also valuable. The 1914-D series minted just fewer than 1.2 million copies of the penny, and has brought in auction over $26,000 for a single uncirculated coin. However, if you happen to find one of the 1909 coins minted in Philadelphia, even with the initials in the wheat, you may be a little disappointed. Over 28 million coins were released from the Philadelphia mint, making these much less valuable. Other wheat pennies are valuable such as the 1922 plain and the 1955 double die which are considered error coins. These coins have brought as much as $5,500 (uncirculated) in auction. The wheat design was replaced in 1959 by the Lincoln Memorial design in the back. The new design, created by Frank Gasparro, was made to commemorate Lincoln’s 150th birthday, and were produced from 1959 – 1966. If you find one of these wheat pennies and are not sure of its value, take it to an expert before spending it. That penny might actually be worth more than just one cent. To find out how to build a perfect coin collection kit, as well as other essential coin collector tips and advice, visit us at GuidesToCoins.com. Article Source: What is a Wheat Penny? Image: credit to the National Numismatic Collection, National Museum of American History.